Kreinik's annual holiday stitch-and-craft-bonanza begins this week with the 25 Days of Free Christmas Projects on www.kreinik.com. We will post new projects each week, so bookmark the page—or make it your home page during this festive holiday season. Each project is designed to be stitched or made quickly, but to result in a stunning holiday treat for your home or to give as a gift. We'll give you the WOW factor to stun your friends with your cool Christmas crafting. 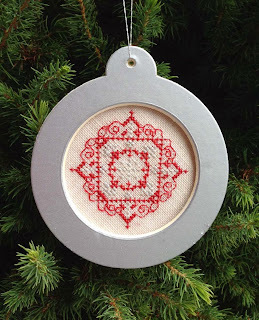 First up: a cross-stitch ornament design from Cathie Richardson of Country Garden Stitchery. This design is a silver snowflake wrapped up in a red Christmas bow. It is quick to stitch (you can make it while you're watching a holiday movie) and the Kreinik Ornament Frame makes finishing instant. Since we love celebrating everything around the holidays, including food, we asked Cathie to share one of her favorite cookie recipes. Enjoy! Combine flour, baking soda, salt and cinnamon in a small bowl. Beat butter, granulated sugar, brown sugar, eggs and vanilla extract in a large bowl. Gradually beat in flour mixture. Stir in oats, cranberries, and white chocolate chips. Drop by rounded tablespoon onto an ungreased baking sheet. Bake for 10-12 minutes. Cool on baking sheets 1-2 minutes and remove to wire racks to cool completely. In the timeline of her life, doll artist Marlene Slobin came late to the craft. She lived a lifetime in her primary career, but creativity was always a part of her personality. 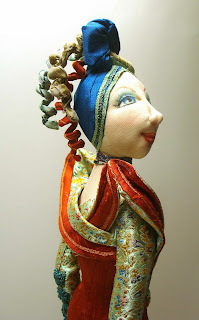 Now retired, she “works” on her soft sculpture and mixed media dolls, and is a legend for her prolific but meticulously created creations. 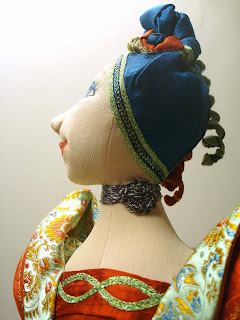 We first met Marlene at Fall International Quilt Market 2012, when she created a gorgeous Kreinik doll for our exhibit. A bundle of energy, Southern charm, and creative passion, she was also working the Treasures of the Gypsy (doll company) booth at International Quilt Festival. “The older I get, the more I seem to do,” Marlene says. Marlene retired from the world of public education in 2002. She authored two books during that career, Making Social Studies Come Alive and Making Social Studies Happen, With Standards, but she still found time to concentrate on her own creative endeavors in her spare time. Even today, though no longer in a classroom, she provides support and training to teachers in the Houston area through the Teacher Mentor Corps. It wasn’t until 2000 that she discovered doll making as her creative outlet. This soon became a passion, and Marlene took as many doll making classes as possible. With each class she began to discover her own style. She is a good teacher and mentor to other doll enthusiasts now, but she is toughest on herself. What excites and challenges her with each new doll creation is the high expectations she sets for herself. Marlene wants to improve with each creation, and it is obvious, as she creates one marvel after another. 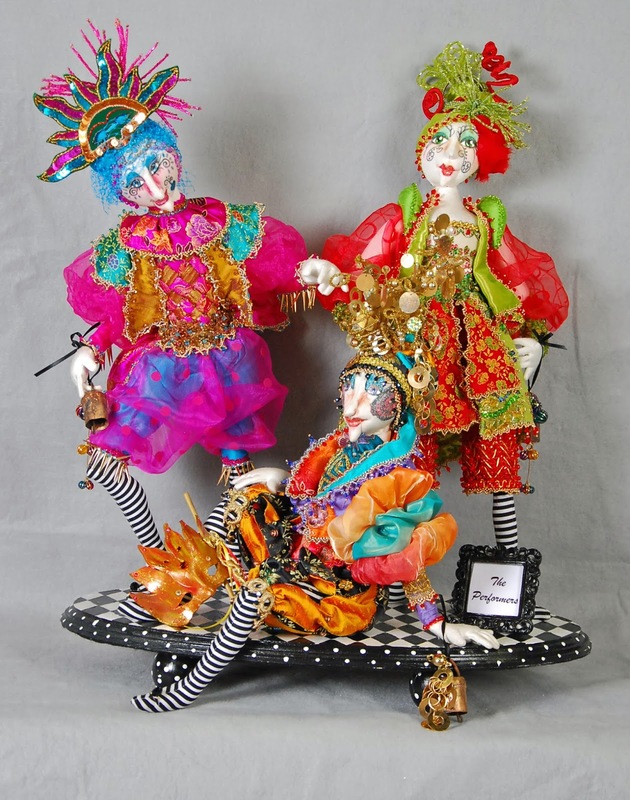 Marlene has exhibited at the Arts Alliance Center at Clear Lake and the Brazosport Art League. 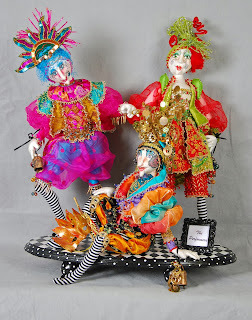 Her dolls have been at the Houston International Quilt Markets and Quilt Festivals, and in fact she won the Treasures of the Gypsy Best of Show award at this year’s festival. 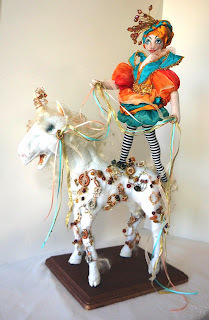 Her work has also been in various publications including Art Doll Quarterly, Soft Dolls and Animals, Cloth Paper Scissors, Doll Crafter and Costuming. This year, she won the Soft Dolls and Animals “You Did What with that Pattern?” contest with one of her designs. 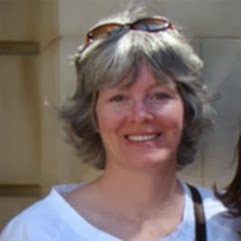 She has also written articles for The Treasures of the Gypsy Challenge. She is a member of the Texas Association of Original Doll Artists as well as Material Girls of Houston doll club. Marlene husband of 48 years, Lester is her most ardent supporter. We are big fans of partners who encourage sewing, stitching, fabric collecting, mess making, and all the other qualities that come with creative people. We thank you, Marlene, for sharing your doll creations with us. We have had the pleasure of displaying a beautiful doll created by Texas artist Dell Jones at International Quilt Market in 2012 and 2013. At last week's Quilt Market, it was featured on our main table in the front of the booth as part of our iron-on thread demonstration (because the doll is embellished with Kreinik Iron-on Threads). We have never seen a doll so photographed and admired by pretty much everyone who walked the aisle (really, no exaggeration). There is just something about dolls, and this doll in particular, that connects with people. Is it the expression in the eyes that draws you? Yes. Take a close look and you will be amazed at the emotion that comes through a painted or stitched doll face. That, to us, shows the talent of the doll maker. But just as with all needlework and art, it's the details that matter as well. Dell embellished this doll with thread, accenting carefully chosen fabrics, using color and stitch variety to create dimension and style. Dell is regularly featured in the special doll exhibit section of Quilt Market and Quilt Festival (for dates, see www.quilts.com). Each year we are delighted to spot the "Dell doll" and see what she has created. Let's hear from Dell herself, and enjoy photos of her work. Let this inspire you, in whatever medium you work, with whichever materials (we suggest trying Kreinik iron-on threads like Dell did…), in any stage of life. "My name is Dell Jones and I was born loving dolls. As a child, I designed their clothes from silk scarfs and anything else my mother would let me have from her sewing box. I earned the money for the FIRST Barbie because my parents thought I was too old for dolls. Little did they know that fifty plus years later I would still be playing with dolls. 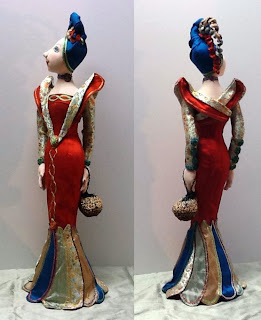 I first became aware of Art Dolls at the Houston International Quilt Festival where I saw the doll exhibit. I was amazed and wanted to make them, too. I bought a Santa pattern and decided he looked more like a Wise Man, so I made three by the next Christmas. Through a mutual friend, I met Marlene Slobin who told me about The Material Girls Cloth Doll Club. I joined at the first meeting and have been learning the art of doll making through classes, retreats, and the incredible sharing of the members. I can't seem to copy a pattern exactly. My imagination just takes off on a tangent. Just like that Santa who morphed into a Wise Man, my dolls are inspired by dolls of the many talented doll artists around the world. I will take something from many patterns and create their costumes as I go. I am also inspired by fabrics, trims, threads, buttons, beads and tons of old junk jewelry. Most of my dolls have been made as gifts or for my own pleasure. Occasionally I have made similar dolls for sale on request. I have always been artistic and have tried every fabric inspired project that came along. But I will readily admit that the world of Art Dolls meets all of my artistic needs and I hope to continue creating them for a long time. As I tell people who ask how I am doing after injuring my shoulder several years ago, "As long as I can give hugs and make dolls, I'm just fine." Side note: Next we will feature Marlene Slobin, mentioned by Dell above, who created another stunning doll design for our exhibit. Wait until you see this one! Stay tuned to the blog.